After 100 years of absence, the wolf found its way back home… to Rome. Once being feared, chased and hunted down, driven almost to extinction in Italy and elsewhere, wolves are returning and settling in Rome with 2.8 million inhabitants again. Researchers were able to photograph two young wolf cubs in the Nature Reserve Castel di Guido. This is the first known wolf offspring by Numa and Aurelia, the wolf couple that founded this first stable family in Rome. Numa – named after the second king of ancient Rome – has been present since 2014. In 2016 he found his female partner Aurelia. This makes at least 4 individuals living right between Rome’s biggest airport, a highway and the Mediterranean Sea. In a few decades, the species’ status shifted from almost extinct to at least one wolf pack in every Italian region, excluding Sicily and Sardinia. “This incredible news, of course, is spreading rapidly around the world, even very far.”, says Alessia De Lorenzis. Rome is not the only big Italian city that welcomed the wolf. 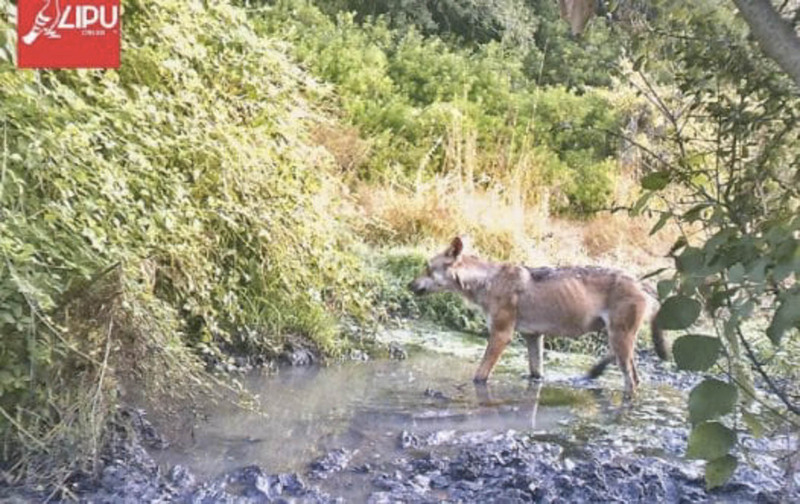 Researchers discovered a wolf very close to Milan photo-trapped in Ticino Regional Park, which is the last natural bio-corridor between the Apennines and the Alps. Good news for those people who fear over their livestock: Analysis showed that the Romolus diet consisted exclusively of wild boar in Castel di Guido. This is a promising sign, as this species is very abundant in the Italian region and also causing lots of conflict and damages to agriculture. Nevertheless, local authorities advice livestock owners to have proper herd management and protection measures in place to avoid depredation. This way we can already prevent a huge part of human-wolf conflicts. This is great news for conservation and for a healthy ecological balance of our ecosystems. But there is a big challenge from a communication point of view. With the close proximity to urbanized areas, the number of encounters between people and wolves will most likely increase. The driver of conflict might change from damages on livestock and pets, to human safety. Saying that the wolf is not dangerous for humans is true, but it’s also not enough. Mauro Belardi, European Soceity Italy and President of Eliante. Wolves are returning to areas where people are not used to living with this species side by side any more. Patience and adaption will be required. How encounters with the wolf and living together looks like, to a huge amount depends on the choices people make. As seen in many human-wildlife conflicts, the tough part is to manage public perception. The main challenge is to create a welcoming attitude for something new. “The truth is that in 2017 a lot of people are used to talk about wolf, but very few of them have a minimum understanding about this species, especially in the area where wolf is lacking since generations.”, says Alessia De Lorenzis. The Italian situation is an important signal also for Europe. Italy is one of the most populated countries in Europe (201 inhabitants per square kilometre). Now that the citizen of Rome are welcoming Romulus and his pack is a best practice example. Regardless of the positive news from Italy, there are for sure going to will be many doom day scenarios being presented by the antiwolf hunting lobby claiming that this will be the end of human civilisation and that children and old ladies will fall prey to Romulus and his pack. Let them scream and wail and let’s celebrate the Italian people for being so smart and welcome in the typical Italian way. We will publish an interview with Alessia De Lorenzis, researcher and responsible of Castel di Guido Reserve for LIPU -BirdLife Italy soon.